A Senate showdown vote on a Republican plan for ending the federal shutdown is on track to occur by early Monday. Democrats say they have the votes to block it. 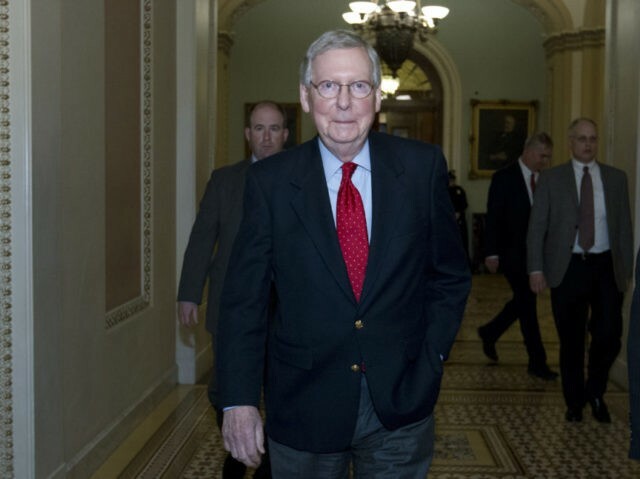 Senate Majority Leader Mitch McConnell has proposed a measure financing the government through Feb. 8. Senate Democrats derailed a House-passed measure early Saturday that would have run through Feb. 16. They say they want to provide enough money to keep agency doors open only a few days. They say the shorter time frame puts more pressure on Republicans to cut deals on immigration and the budget. The shutdown began at midnight Friday. The public won’t feel its full effects until the next workweek begins Monday. The vote would occur by 1 a.m. EST Monday but could happen earlier. Hours after shuttering much of the federal government, feuding Democrats and Republicans in Congress spent the day dodging blame for a paralyzing standoff over immigration. The two sides show few signs of progress on negotiations to end it. The finger-pointing has played out in rare weekend proceedings in both the House and Senate, where lawmakers have been eager to show voters they are actively working for a solution — or at least actively making their case why the other party is at fault. Democrats refused to provide the votes needed to reopen the government until they strike a deal with President Donald Trump protecting young immigrants from deportation. They also want more disaster relief and a boost in spending for opioid treatment and other domestic programs. President Donald Trump is “frustrated” by the government shutdown falling on the first anniversary of his inauguration. That’s according to budget director Mick Mulvaney, who tells reporters that the White House believes Democrats provoked the fiscal crisis to distract from Trump’s accomplishments in his first year in office. He adds of Democrats that Trump “kicked their butts for a year” and charges they were looking for a way to embarrass the administration. Mulvaney says it is up to Democrats to decide when the government will reopen, and that the White House won’t negotiate on immigration until Democrats agree to turn the lights back on. Republicans are using the phrase to cast blame on Senate Democratic leader Chuck Schumer, but House rules bar floor remarks impugning another lawmaker. After private discussion, Sessions agreed to withdraw the comment. Debate was soon halted again after Alabama GOP congressman Bradley Byrne displayed a poster-size photo of Schumer with a 2013 quote calling a shutdown “the politics of idiocy.” Arkansas congressman Steve Womack, the presiding officer, allowed the poster, but Democrats objected and forced a roll call vote. Lawmakers voted, 224-173, to allow the display. Republicans and Democrats appear to be no closer to ending a government shutdown, and the White House is indicating it’s waiting for Democrats to drop their demand that a funding bill include protections for younger immigrants brought to the country illegally as children. Budget director Mick Mulvaney and legislative affairs director Marc Short are lobbing verbal attacks at Democrats for blocking a spending bill over the unrelated legislation. Mulvaney says the administration is trying to mitigate the impact of the funding lapse, noting many national parks and government offices will be open during the duration. But he says the effects will still be significant. Democrats are blaming the shutdown on Republicans, who control the White House and Congress. The White House says President Donald Trump will not attend a fundraiser at his Florida estate because of the ongoing government shutdown in Washington. Budget director Mick Mulvaney says Trump will not appear at the high-dollar fundraiser Saturday night at his Palm Beach estate. Trump is scheduled to depart Washington for the Swiss Alps on Wednesday evening. A number of White House staffers and agency advance teams are already on the ground awaiting his arrival. A Florida fundraiser celebrating President Donald Trump’s first year in office will go on with or without him. That’s according to a Trump campaign official who was not authorized to publicly discuss planning and spoke on condition of anonymity. Trump had hoped to spend the anniversary of his inauguration in Florida attending a high-dollar fundraiser taking place Saturday night at his Palm Beach estate. Instead, the president is reckoning with a federal government shutdown brought on by disagreement with lawmakers over what should be included in a government funding bill. Trump scrapped plans to depart Washington on Friday. It remains unclear whether he still plans to attend. Tickets start at $100,000 per couple and $250,000 to attend a round-table. The proceeds benefit a joint committee between Trump’s campaign and the Republican National Committee. House Democratic Leader Nancy Pelosi is rejecting a fallback plan by Republican Senate Majority Leader Mitch McConnell to pass a short-term spending plan through Feb. 8. Pelosi says “there’s no point” in approving a short-term bill unless both sides agree on how to move forward. She and other Democrats said Saturday that they want “parity” on spending increases for defense and domestic programs such as opioid addiction and community health centers. Pelosi says that even without a dispute over immigration, Democrats would not agree to a GOP spending plan unless it pays for domestic programs Democrats consider crucial. Democrats have blamed the shutdown on Republicans, who control Congress and the White House. Republicans say Democrats are “holding our government hostage” to win protections for young immigrants brought to the country illegally as children. Republican House Speaker Paul Ryan says the partial government shutdown is “utter madness” and he is blaming it all on Senate Democrats. Ryan said Saturday that the Democrats are “deliberately holding our government hostage” to win protections for younger immigrants brought to the country illegally as children. The shutdown is marring the anniversary of Trump’s inauguration. For a businessman who made his career selling himself as a deal-maker, he is struggling to find consensus with Congress on a funding agreement. The White House says Trump will not negotiate with Democrats over their demands to provide legal protections for roughly 700,000 young immigrants known as “Dreamers” until the government is reopened. President Donald Trump had been set to leave Friday for a fundraiser Saturday at his Florida estate marking the anniversary of his inauguration but delayed the trip over the shutdown. It’s unclear if he will attend. House Democratic leader Nancy Pelosi is giving President Donald Trump an F for “failure in leadership” on the anniversary of his inauguration. President Donald Trump is blaming Democrats for the government shutdown — tweeting that they wanted to give him “a nice present” to mark the one-year anniversary of his inauguration. Trump is accusing Democrats of being more concerned with “Illegal Immigrants than they are with our great Military or Safety at our dangerous” border with Mexico. He’s also noting there are 51 Republicans in the Senate, and it takes 60 votes to move ahead on legislation to keep the government running — so some Democratic support is needed now. In Trump’s view, “that is why we need to win more Republicans” in the midterm elections. That means a halt to all but the most essential operations. And the shutdown is marring the one-year anniversary of President Donald Trump’s inauguration. It’s a striking display of Washington dysfunction. Last-minute negotiations crumbled when Senate Democrats blocked a four-week extension. And that’s led to the fourth government shutdown in a quarter-century.